What does lasers have to do with cycling?!? 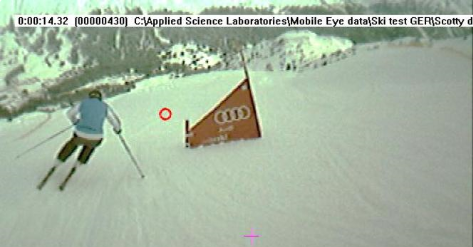 It is more than a laser at the finish line……. Unfortunately an ebook pdf doesn’t allow me to put this article’s conclusion (video) right in front of you – so here we have innovation number 3! For some time, even sports broadcasters have been looking at the application of real-time camera tracking using sports pitch markings but for an elite cyclist how can this technology be utilized in competition – either on their person or through instantaneous feedback on the team radio? If we focus on ‘mobile solutions’, in 2012 researchers at the University of Missouri announced that they had developed new software using the GPS and imaging abilities of a smartphone to determine the exact location, speed & direction of moving objects. Of course this had implications for soldiers but it could also be utilized by cyclists trying to determine their own ‘field target’ – how many times has the TV commentator said we need to wait until the next checkpoint to see how far ahead the rider is? Imagine the implications in a time-trial or breakaway if you knew the rider ahead was X distance away at any time point? How does it work? If the size of the target is known, then the software computes the latitude and longitude of the target using the smartphones’ GPS location, compass reading, and the distance to the target based on the relative size of the target in the image compared to its known real-life size. If the exact size of a target is unknown, the software uses two images to triangulate the location of the target. It can also track moving targets. By taking a short video of a moving target, the smartphone software can calculate how fast the target is moving and in what direction it is going. 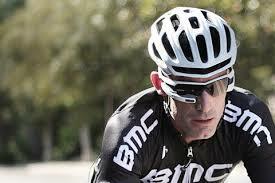 In the era of Google Glass, there are now real time applications for this in wearable technology. As you will see from this summary of eye tracking in sports, there is a real enthusiasm in innovation teams for it’s functional use in elite competition. For example in skiing, investigators at Victoria University in Melbourne and the University of Calgary (Canada) are using ASL Mobile Eye tracking glasses to study the improvement of athletic performance by measurement eye movements in training – which enables the coaching team to give feedback on attack lines & making split-second decisions. – “…The computer is configured to determine a pupil location of the at least one eye of a wearer of the HMD from the received images” – Where should you be looking when in the ‘game’? – “….The HMD further includes a camera configured to image the viewing location by collecting the reflected infrared light and a sensor configured to generate sensor data that relates to the motion of the HMD” – Going back to review how the competition/training played out. 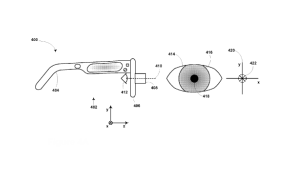 Very few Glassware applications have utilized the Glass infrared sensors, but this patent opens the door for some innovative technology in the future. I need to get a sample product of this!! Furthermore for the casual reader/tech geek, you may not be aware that there is more than Google Glass in this tech field – as described in the Huffington Post. Recon Labs – born from a 2006 MBA project – offers wearable headsets aimed at the sports enthusiast – and we are not just talking skiers but skydivers, wingsuit pilots and BASE jumpers. The new ‘Jet‘ product is aimed at the biking, boarding, trekking community and is designed to give feedback on everything from elevation gained and mileage covered. As you would expect it also can connect via WiFi & Bluetooth to third party fitness monitors. I don’t think we are going a 100miles away when we are talking about the use of these mobile devices in the Tour de France, not just to give feedback to coaches but real time, visual reference to riders. These technologies are all mobile. If we want to look at the mega-bucks, NASA-like, engine room (or at least a laptop) systems, well then we have already seen the results of a BAE Systems partnership with the British Cycling Team (under the £1.5 million Technology Partnership with UK Sport since 2008) – a truly dominating display in the 2012 London Olympic velodrome. 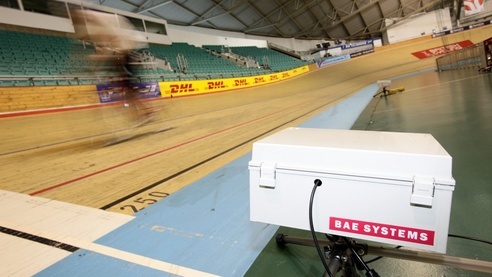 Dave Brailsford (Performance Director at British Cycling) & Kelvin Davies (BAE Systems Project Leader of the UK Sport Technology Partnership) integrated laser timing technology into performance monitoring (derived from a battlefield identification system), improving on the previous break-beam systems. The team was able to track 30 riders simultaneously – with millisecond accuracy – using retro reflective tags and look at new ways in giving cyclists the edge in their training and preparation. In a sporting arena there has been considerable interest & investment in laser tracking in sport – whether that’s in football or NFL – and to predict the application of this technology in cycling, it is important for any reader to aware of these developments. The NFL is currently debating the use of laser systems to mark first downs and of course FIFA is implementing goal-line technology [Those guys at hawk-eye must be licking their lips after all their success in tennis & cricket!]. As we start to get into the world of remote, flying drones and Formula 1 like budgets in procycling teams, I don’t think – with these developments in the sporting world – it would be rash to suggest top secret systems being tested to follow the peloton around the Ardennes countryside. 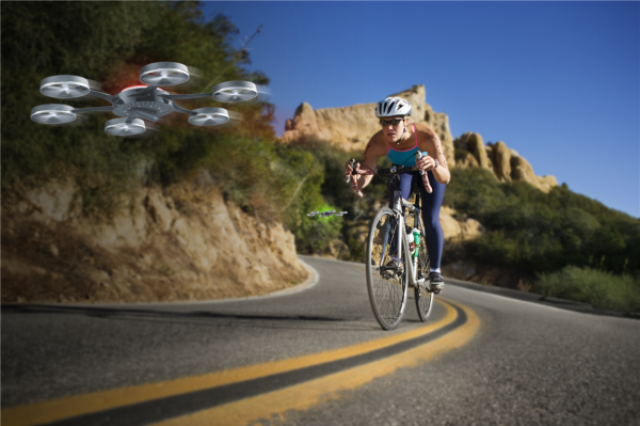 In fact only in January, road.cc published an article on ‘Drones – the next big thing in cycle safety, or a case of too much blue sky thinking?’. If you are interested in seeing the full list of 10 top innovations in cycling, why not sign up to our newsletter HERE We send it out once a month with only the best articles from the world of endurance sport and news! I can tell you the other innovations include Shark Skin, a wearable ice bath, spitting out sports drinks and zapping yourself with electrodes! international ublic field markets and enterprises. Keep up the amazing works guys I’ve you guys to my blogroll. hi!,I like your writing so so much! percentage we be in contact more approximately your article on AOL? I require a specialist on this space to solve my problem. Maybe that is you! for a while and yours is the greatest I have came upon so far. Normally I don’t read article on blogs, however I would like to say that this write-up very compelled me to take a look at and do so!